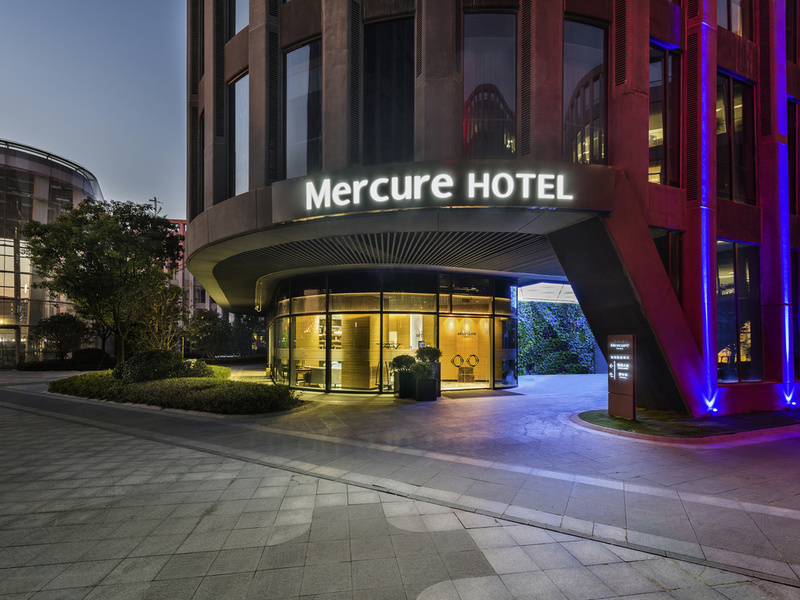 Mercure Shanghai Hongqiao Railway Station is located in Sincere Ctr within the Hongqiao Business Zone and next to Hongqiao Economic Development Zone. It is only 10 minutes on foot from Shanghai Hongqiao Railway Station. Also 9 minutes by car from National Exhibition and Convention Centre Shanghai, 15 minutes from Hongqiao Intl Airport Terminal 1, 7 minutes from Terminal 2, 35 minutes from People s Square and 60 minutes from Pudong Intl Airport. Shanghai is China's biggest city and a global financial hub. The Bund, which is at the heart of the city, is lined with colonial era buildings. Mercure Shanghai Hongqiao Railway Station is located in Sincere Center within the Hongqiao Business Zone. It is next to Hongqiao Economic Development Zone, close to Hongqiao International Airport and Shanghai Hongqiao Railway Station. The hotel has 180 rooms across the different categories. All come with free high speed WiFi, LED flat screen TV, fully equipped bathroom and excellent views. The well decorated Rui Restaurant is located on level 1 and can host up to 68 guests. It offers a buffet breakfast as well as a business set menu. Our bar on level 1 serves a wide selection of alcoholic as well as non alcoholic beverages and can host up to 68 guests. Its warm environment and relaxed atmosphere is perfect for guests to chill out. It was only 10 min. walk from the railway station and I was very pleased to be welcomed at reception as an Accor bronze member. Although staff were unabled to speak English fluently, they were attentive and cooperative using a translation device. My bbz trip was in Hefei (I decided to be back Shanghai before leaving China) As expected, it was quite beautiful city in spite of short stay. After check-in hotel, I can enjoy the night of Shanghai. This hotel can be reached by walk in 10 min from Hongqiao railway station. Booked from HUAZHU APP , I am a gold member in HUAZHU, the staff said the price is better than book form Mercure website. This is my fifth-time stay in Mercure, the staffs are friendly, the breakfast is not as good as I think( compare to the hotel price, it is worth.) . The location is good (close to Hongqiao airport & railway). I wanted to stay one more day, unfortunately, it was fully booked.I have to change to another hotel : ( will book again if I travel in that area. Thanks. Wonderful place near Hongqiao railway station and the room is really new and comfortable. The staff there are so nice, and gave me some drink as gift. Room was ok. Receptionist were soso. Quite far from train station. Very good very convinent!! However it’s quite troublesome when a visitor come and visit since they need to register first at the reception. Comfort environment and room. Breakfast can be improved by adding more type of foods. This was the second time I chose to stay here but failure to meet small details makes me reconsider any future stays. After checking in and having a shower, the receptionist staff came to knock on the door to request a picture of my passport again. This should have been avoided as the check in process at reception involves sorting out any issues to enable tired travellers to rest and be unbothered. Secondly, as a member of Booking.com and Accor Group, a late check out was programmed for the following day. However, after having breakfast, we found the service staff in the bathroom and had entered our room without any consent (or warning) and the beds had been made. Consequently, we had to speak to reception to clarify this and were brought some refreshments. Although this may be something trivial, it does have a major impact on the impression of the hotel and its staff. Furthermore, it begs the question of where exactly is the customer service and care to its guests. I do hope that you do something about this matter which disrupted my travels and image of you making me rethink whether I should stay at your hotel in the future or not. This hotel gave a general impression in all aspects that, it is a local hotel under an International brand name.